This is what Hillary Clinton's defeat looks like. 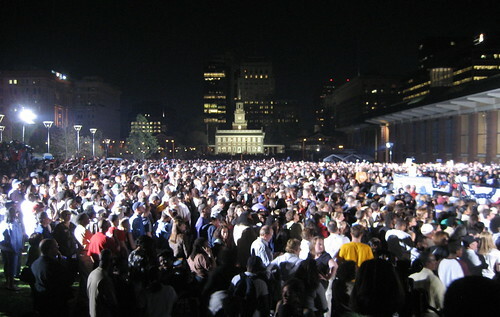 35,000+ for Obama in Philadelphia. 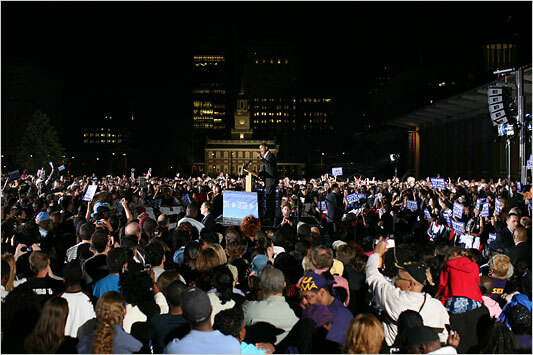 PHILADELPHIA — Senator Barack Obama drew what may be his biggest crowd yet here Friday. His campaign, quoting Frank Friel, director of security at the Independence Visitor Center, pegged the number at 35,000. This is a defining moment in our history. Our nation is at war. Our planet is in peril. Our economy is in recession…. [M]ost of all, we’ve lost faith that our leaders can or will do anything about this; we don’t believe that anyone in Washington is listening to us, or standing up for us, or fighting for us. That’s why this election is our chance to declare our independence from the broken politics of Washington, the cynical politics that puts spin ahead of solutions and the special interests ahead of our interests; the politics that’s all about tearing each other down when what we need is to lift this country up.